Does Your Young Horse Need a Dental Exam? Many horse owners have a younger horse (under 6 years of age) these days. 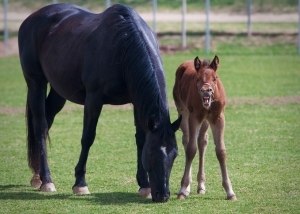 Whether the horse was born on your place, or you purchased a weanling to train into your dream horse, remember that these young horses have dental needs just like adult and senior horses do. 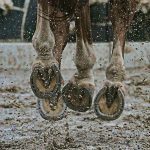 I commonly hear from clients who think that younger horses don’t require regular dental work, or don’t need dental floating as frequently as their older horses. This old misconception is just untrue. In fact, usually the opposite is the case. Younger horses can have deciduous teeth present (baby teeth that will fall out) and even their adult teeth are very soft since they don’t have the amount of calcium present in the enamel. This means that those younger horse teeth are changing MORE in a year than their older horse counterparts. 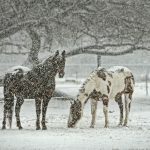 Since a horse doesn’t even have a full set of adult teeth until they are around 6 years old (although they could have a full set by as early as 4 years old), what are some of the issues that commonly happen to younger horses as their teeth erupt and they lose their “baby” teeth? We’ll explore some of those conditions, and then discuss when it is a good time for their first exam and float. This can happen when the premolars do not properly shed their deciduous “caps” off of the erupting adult tooth. While this should be a process that happens on its own, it is not uncommon for a part of those caps to break off or “hang up” while they are shedding. Either of these issues can be remedied with a sedated full-mouth speculum exam and some forceps to grab and extract the offending culprit. The bonus is then you have a little “souvenir” of your horses’ baby teeth that you might not normally find! I get 2-3 calls every year about concerned owners of 2 and 3 year old horses that are developing bumps along their lower mandible. These bumps are a normal part of aging, and especially prominent if you have a “fine featured” horse head that you are looking at (Arabian owners know what I mean!). Most of the time these bumps are completely harmless, BUT they can occasionally get injured or become infected due to other processes happening. If you see the swellings grow larger or even break open into a sore or draining wound, make sure to contact your vet. 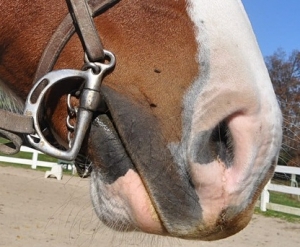 The incisor teeth are the teeth in the front of the mouth that everyone sees when they pull a horses’ lips back. It is true that you can get an idea of the horse’s age by inspecting these teeth, but it is an inexact art form, to be sure. The teeth erupt in a set pattern (from middle to lateral at 6 days, 6 weeks, and 6 months) for the deciduous teeth, and also for the adult teeth (at 2.5, 3.5 and 4.5 years of age). Often times I get asked about a “broken” tooth or cut lip and often it is a normal loss of these incisive deciduous teeth. HOWEVER, it is also quite common for young male horses to fracture incisors since they are exploring their world with their mouth a lot. If you have any questions about what is normal, as always, ask your vet. At what age should my horse get their first float? The answer is not a straight-forward one, but rather is reflective of what you are using your young horse for. If they are in a discipline where early training for 2 year old shows or 3 year old shows is happening, then we recommend the first float and exam in 2 year olds. If you are not training in some of these aged events, then 3 or 4 years old would be the time to consider your first float. But keep in mind, once your young horse is wearing a bit on a regular basis, it is time to consider the first float. This helps to file down the sharp enamel points that happen on the baby teeth (think of the sharp points on puppy teeth and you have an idea of how sharp those enamel points on young horse teeth can be!). A comfortable mouth with no sharp enamel points present allows your young horse to focus on the introduction to head tack WITHOUT the distraction of oral pain or discomfort. I hear the most accolades from my clients who own young horses after floats, almost always regarding how much better the horse is doing with their training and showing now.